New Holland has just launched a completely new line of tractors – the Series TT – to compete in the highly competitive, low horsepower end of the market. The two-model series, which perfectly compliments the existing TDD range, offers the perfect entry-point to the New Holland brand experience. It aims to hit the low-cost, low-spec market head-on with units that are simple to operate and easy to maintain with low running costs. The two models, the TT55 and TT75 are rated at 40.5kW (55 Hp) and 55.1 kW (75 Hp) respectively. 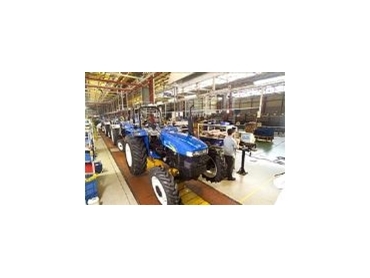 They are manufactured at New Holland’s purpose-built US$55 million facility in Delhi, India. “The range will directly compete with low-cost Indian, Korean and Chinese produced models, and not compromise on quality,” said New Holland Marketing Manager, Simon Vigour. The models are ideally suited to small acreages such as hobby farms, market gardens and small livestock operations and their robust, yet uncomplicated design, will please those customers with a low desire for technology and a high desire for self maintenance. “The TT range meets the high standards and quality farmers have come to expect from New Holland tractors,” Simon said. “Our India facility, which has been in operation since 1999, features the latest in modern manufacturing with world-class quality control and an annual capacity of 30,000 units. There are also two ranges of four forward and one reverse speeds with an independent PTO operating at 540rpm. Other features include mechanical hydraulics with “Lift-O-MaticTM” control for a fast and maximum lift of 1,525kg through the lifting range. The TT55 and TT75 are offered in either two or four wheel drive with a fixed ROPS and canopy as standard.